Chattanooga is one of the most scenic locations in all over Colorado. For many years I simply viewed the scenery in awe without even realizing a town once existed here. Originally known as Sweetwater or Sweetville, the Chattanooga Post office was established in 1883 at the head of Mineral Creek. 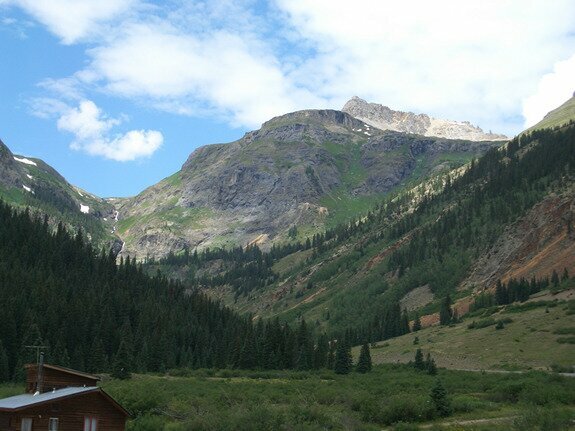 Originally, it served as a supply depot for people coming to the Red Mountain area. At its peak, its business district included grocery stores, bakeries, a drugstore, two butcher shops, three boarding houses, and three saloons. 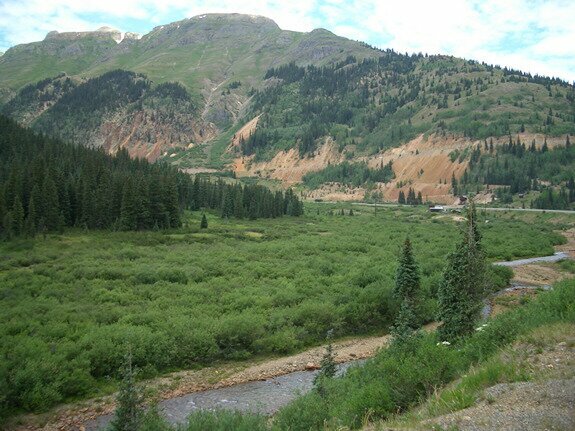 In 1888 the Silverton Railroad reached the Red Mountain District from the south, eliminating the need for a staging area from the north. In 1889 an avalanche roared through the town, destroying much of it. Most moved on. Today, the BLM maintains avalanche control by firing howitzer rounds into the snow up above to cause an avalanche under controlled conditions. Some structures, however, still remain. Chattanooga was also sometimes called Sheridan Junction, due to the prominence of the Sheridan hotel. Displaying Chattanooga photography page 3 out of 3. Date Taken: 2014:06:09 14:12:16 Want to use this image? See the More information tab. Date Taken: 2014:06:09 14:15:06 Want to use this image? See the More information tab. Date Taken: 2014:06:09 14:15:53 Want to use this image? See the More information tab. Date Taken: 2014:06:09 14:16:50 Want to use this image? See the More information tab. Date Taken: 2014:06:09 14:17:36 Want to use this image? See the More information tab. Date Taken: 2007:07:18 10:51:31 Want to use this image? See the More information tab. Date Taken: 2007:07:18 10:54:36 Want to use this image? See the More information tab. Date Taken: 2007:07:18 10:54:51 Want to use this image? See the More information tab. Date Taken: 2007:07:18 10:55:27 Want to use this image? See the More information tab. Date Taken: 2007:07:18 11:03:41 Want to use this image? See the More information tab.